In this episode, you will learn how the festival came to be. You'll meet some of the musicians who have performed there since the beginning. You'll hear their music and some of the stories I recorded at the faire. Some are about travel or women in music, hypnosis, and juggling. There's a lot to unpack. And you get 3 1/2 hours to do just that. Welcome to the Pub Songs Podcast, the Virtual Public House for Celtic culture through music. My name is Marc Gunn. I am a Celtic Geek musician and your guide to honoring our past and adapting for our future. Today’s show is brought to you by my Gunn Runners on Patreon. Your generous pledge of $5 per month allow me to create music, podcasts, and my weekly video show, Coffee with The Celtfather. Thank you! If you have comments or want to chat in the pub, email me. Use #PubSongs when talking about this show. I want your feedback. What are you doing today while listening to the Pub Songs Podcast? How has this show inspired you? Send a written comment along with any pictures to marc@marcgunn.com. Use the hashtag #pubsongs in the subject of your email. Troy Rodgers emailed before my last Celtfather Evenings show: "I've got my ticket! See you there! I keep meaning to offer Pub Songs feedback. Let me do so now. I love the new format. The latest episode... How America Saved Irish Music is one of my favorites of your albums. To hear you and Jaime discuss everything that went into this, it's gold. Excellent podcast." 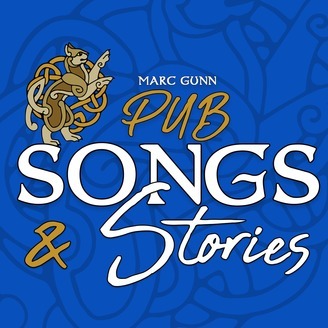 Pamala emailed: "Marc, I fell asleep listening to #PubSongs last night. Your voice is so soothing and the music is just right so my brain settles down and sleep. I woke this morning with a smile because of you and your music being in my ears. Thank you for all you do to share this wonderful music and yourself. Blessed Be, Pamala"
I want your Ireland or Celtic Travel Questions. Email me! Brobdingnagian Bards are launching a Kickstarter in July. Subscribe to our mailing list and podcast. Help me move. Buy a shirt! 2:48:47 Celtic Invasion Vacations: Dingle, Ireland 2019 Every year, I take a small group of Celtic music fans on the relaxing adventure of a lifetime. We don't see everything. Instead, we stay in one area. We get to know the region through it's culture, history, and legends. You can join us with an auditory and visual adventure through podcasts and videos. The Pub Songs Podcast is listener-supported. If you enjoy visiting the pub, please join the Gunn Runners Club to get more podcasts, videos, bootleg concerts, and exclusive MP3s. Special thanks to my newest patron: Elizabeth B. Thank you for so kindly supporting my music. Go to marcgunn.net to join the Gunn Runners on Patreon today. Let's make a friendlier world. Apr 19: Interstellar Ginger Beer & Exploration Co. Sat, May 4: Interstellar Ginger Beer & Exploration Co. This is my farewell to Birmingham and Gwen’s congratulations on graduating, and Inara’s happy birthday celebration. Join us! 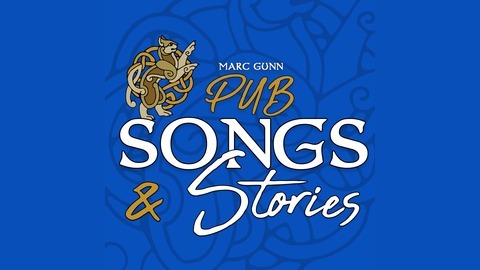 Pub Songs Podcast was produced by Marc Gunn. To subscribe, go to Apple Podcasts, Spotify or to my website where you can join the Gunn Runners Club on Patreon and support my music and this podcast. I’ll also email regular updates of new videos, podcasts, stories behind the songs, plus 21 songs for free. Welcome to the pub! www.pubsong.net.